Outernet is a service intended for providing web-based information to individuals without access to the web. It is a startup computer and still going through much revision. The service will surely morph over time as interest and finances grow, but for now it’s an exciting project to be able to monitor and receive (even if I do have an internet connection!). Winegard Ku dish – it’s entirely possible an old Dish Network or Direct TV dish could be repurposed for this project, I’m just not sure. Linear Ku .4dB LNB – even if you repurpose a commercial dish, you’ll still need a universal LNB, check other sources because these can be purchase cheap. 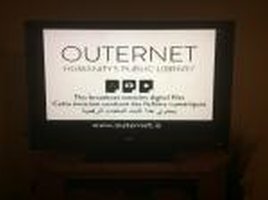 Generic USB DVB-S receiver – Be sure your receiver is supported by the Outernet software! The software for an Outernet receiver (ORx) consists of a few pieces. So, with our dish aimed at Galaxy 19, we can test and fine-tune the dish’s signal with either a signal meter or by connecting the coax right to the DVB-S receiver. The signal meter will output a steady tone that will peak when you are aimed squarely at a Ku satellite – not just G19, so be sure you’re aimed at least close to 97°W. Besides adjusting east and west, you may also need to adjust the angle the dish is pointed (you might also adjust the rotation of the LNB to eek a little stronger signal out of the bird). Tools like GeoSatFinder will get your signal close, but a small amount of tweaking can help get the strongest possible signal for your exact setup and location. If you do not have a satellite signal meter you can use the DVB-S receiver connected to a desktop to monitor the video quality of any feed. Outernet is (at the time of writing) on Transponder 27 for Galaxy 19. If you are seeing the white background Outernet screen shown above, you are ready to begin configuring the Pi to handle the bitstream coming off the satellite. Then you will be able to download librarian (from link above) using wget Then you can use pip to install the version of librarian your downloaded. Download the windows driver file US2B0D.sys to extract the part you need. Then, run each of the following commands. The steps below will: extract the driver into a usable format, rename the device ID, copy the file to the firmware directory so the rpi-update process will pick it up and install it. You’ll then have to reboot (as per the rpi-update directions) for the changes to take effect. For any FAQ or support related issued, consult the Outernet community. For further review, you might check out this ORx HOWTO guide. I am an ARRL ETP instructor for the ARRL Teachers’ Institute and an Instructional Designer and faculty at LeTourneau University, W5LET, in Longview, TX. I am also a doctoral candidate from the University of Texas at Brownsville. My current research interests include epistemology and the efficacy of education technology.